Nothing from April 19, 2019 to April 19, 2020. Welcome to Aidan Brooks Racing! Aidan Brooks is an up-and-coming junior racer of quarter midgets, racing in three divisions: Senior Honda, Senior Animal and Light 160. At just 10 years old, Aidan has had the opportunity to race in many regions of the country against the best child drivers in the country! Aidan is a history buff and winning his final Novice race on September 11 at RMQMA (IMI~Dacono) was very meaningful for him. With an unconventional non-racing background and a quick, analytical mind, Aidan’s thought process is very different than most racers— giving him quite a competitive edge. 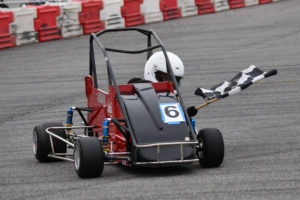 However, he still maintains humility and compassion towards other drivers, as well as his classmates, making him both a great competitor and sportsman. Aidan is a hard-worker, compassionate, and funny.